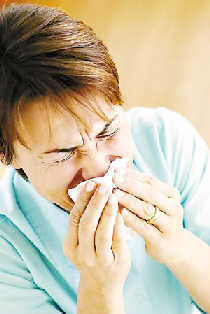 Experts believe they have now finally solved the tricky question of why winter is notoriously known as the flu season. It is a mystery that has baffled doctors for decades. But experts believe they have now finally solved the tricky question of why winter is notoriously known as the flu season. According to new research, the influenza virus coats itself in a protective fatty shield that is tough enough to withstand cold temperatures. The butter-like material only melts when it hits the respiratory tract, leaving the virus free to infect cells - a process scientists say is like an M&M melting in the mouth. However, in warmer outdoor temperatures, the protective coating melts before it reaches a person or an animal, killing the germs before they can infect someone. Joshua Zimmerberg, from the National Institute of Child Health and Human Development (NICHD), in the US, which led the study, said: 'Like an M&M in your mouth, the protective covering melts when it enters the respiratory tract. In the past scientists have worked on theories that flu is more common in winter because people spend more time inside or the radiation from the sun in summer kills off germs. But no research has successfully explained the spread of the disease. Researchers have already claimed that the report, which is published in the journal Nature Chemical Biology, could lead to new ways to prevent and treat flu. Duane Alexander, the director of NICHD, said: 'The study results open new avenues of research for thwarting winter flu outbreaks. Influenza and other respiratory viruses are spread in small droplets broadcast by coughing, sneezing and talking and which can also settle onto surfaces, to be picked up on fingertips.